Tutorial 137, based on the quick-tip 26 program, creates a form with contains a combo box and a panel. The combo box holds all the valid colors for the color class. When you select a color, the program changes the panel into that color. The tutorial program also plots a moving average. The color of the new plots are changed according to the color selected. Using a plot of a moving average is a trivial example but should show how the color could be changed by the user interacting with a form and could be applied to more complex programs. When tutorial 137 is initialized the form (containing the combo box and panel) is opened and all the valid colors are loaded into a vector. A counter goes through a loop and adds the vector contents into the Combo box, one element at a time. The program also draws small rectangles for each element in the vector. When a user chooses a color in the combo box the SelectedIndexChanged event is fired. When this occurs the color of the panel is changed to reflect the color selected. The color is also stored in a variable (PlotColor) in RGB form. 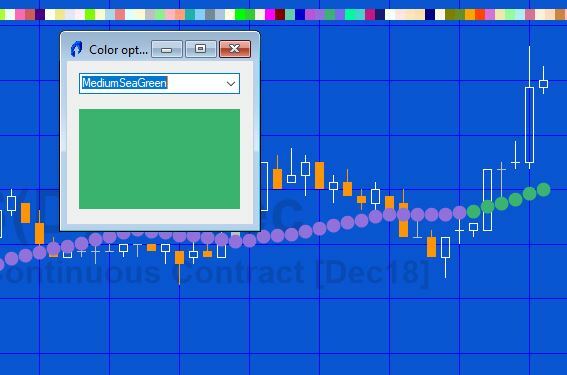 A moving average is plotted and its color is set to PlotColor. The tutorial 137 show-me study (_Tutorial137) is available for download for $19.95 by clicking the following link. The program works with TradeStation version 9.5 and newer versions.
. If you are a God Pass member do to the Gold Pass area below to get your free download. Please let me know if you notice any mistakes or errors or have questions.